lui – ma aveva quegli occhi. nel sicuro sole del Nord. the colour of famine. Empty. with no soil, of river beds with no water. Cultivated by the moon, the leas. that the summer never loved. have begun, and it did not begin. the son – but he had eyes. overlooking the prophetic Ionian Sea. must you alone fight for your pay? Can’t you see how they venerate you? in the safe Northern sun. have obtained for them in vain. was not light but rationality. the hand of the people of Calabria. and bread and cheese, wrapped in yellow Easter Monday sheets. They will bring with them grandmas and donkeys, on triremes stolen from colonial ports. in the Cities of the Underworld. they will fly before Wilayah. at the bottom of the sea, they who lived like madmen in the sky. Pier Paolo Pasolini was an Italian poet, journalist, philosopher, novelist, playwright, filmmaker, newspaper and magazine columnist, actor, painter and political figure. He was a highly controversial figure whose work remains controversial to this day. 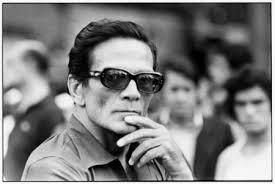 Since his death Pasolini has come to be valued as a visionary thinker: his poem Profezia is a perfect example of this. Although it was written in 1964, it could have very well been written yesterday. It can be found in Alì dagli occhi azzurri, Garzanti, Milano 1996.